so the guy who made the battleroyale mod for arma 3 and later h1z1 got to make his own game. this one is more simlike compared to h1z1 and feels very similar to arma/dayz but in UE engine. no aus servers atm but they've said they're willing to set them up wherever the players are. ^ if you're thinking of getting it you should know it still needs a lot of work. it's extremely clunky at the moment, with my gtx1060 and FX-8150 i have to have everything except texture detail on ultra low and some launch options in stream to make it use all the cpu cores. optimising will come later but unlike h1z1 at least you can get into a game without a dice roll to see if someone in your squad glitches out and can't pick up items or freezes the server queue for everyone. biggest difference is where h1z1 only has melee, pistols, 1x shotgun, 1x ar15, 1x ak47 and 1x hunting rifle, battlegrounds has a lot more military weapons and attachments. while you're looting you also come across suppressors, compensators, vertical grips, stocks, magazine mods (extended + quickdraw) and scopes (red dot, 4x, 8x, 15x). some are generic, some only work with a particular gun. this introduces a lot of imbalance which worries me a bit. these things make a huge difference and the advantage will go to whoevers lucky enough to find certain weapon mods (particularly x8 scopes and silencers). in h1z1 it's a more even playing field gear-wise, it's then down to comms, positioning and getting the jump on people. the map is 64km2 (same as h1z1) but instead of americana it's set on an island with numerous villages and towns. currently maxes out at 100 ppl per round which is less than h1z1 (~160) and with the loot areas spread out more your ttk after the landing shootout seems quite high. i've seen a sedan and a 2 man buggy so far and you kinda need them because when the gas circle closes in it's pretty fkn fast. airdrops are in the game but instead of the h1z1 carpet bombing there's an occasional red circle on your map that seems to appear randomly. if you get caught in one you have to leave or find cover before it rains mortars. it's an interesting mechanic. maybe a bit too random? time will tell. it didn't kill h1z1 overnight and while it'll poach a lot of players i don't think it will. the arcadey feel and graphics in h1z1 means you aren't thrashing your system to try and distinguish grey blobs in a wash of detail. there are things i like and hate about both games. right now i think h1z1 is more fun to play. they both need work, battlegrounds just needs a LOT more. I actually enjoy this a lot more than h1z1, the gun play is very solid. I found it easier to see peole when I turn post processing and AA ad down as far as they will go. Don't say around the rocks if that's not what you mean. Been growing on me. Rounds feel much quicker than h1z1 where you end up dicking around a lot either looking for fights or hiding from them. Once the first gas stage starts on Battlegrounds you've already had a few fights and are done with looting. The biggest gripe I have at the moment is server performance but with Aussie servers coming in the next couple of days I won't be able to use that as an excuse for long. The aussie servers will make the whole experience so much smoother. Should remove that annoying mini delay opening doors, picking up loot etc. My experience so far has been solo. 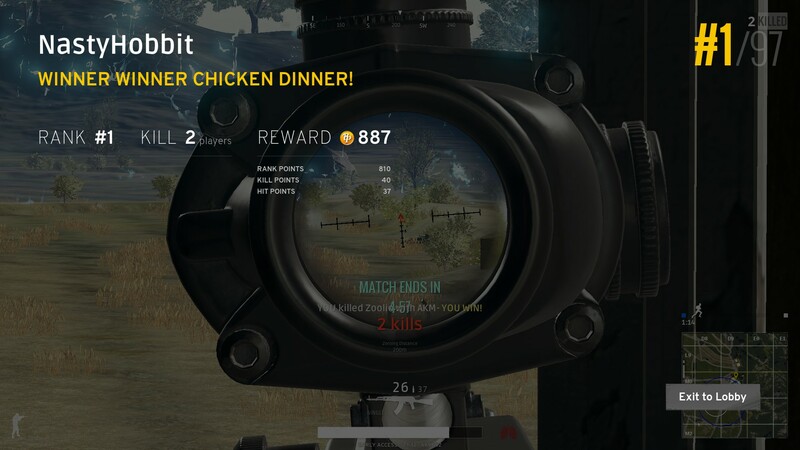 I played in one duo with an american guy but without me being able to speak on voice comms and him being able to, i felt bad as i was gimping him. He was killed but i killed the two guys who got him, then got one further kill down the track but most of the map was a bit quiet. My only issue with these kinds of games is that downtime between the gas moving. This is at least not too long, but once you're looted up, you can literally just be laying prone hidden and waiting. what i like about these types of games is that every round is different. When someone shoots at you in Battlegrounds, you might hear three different sound effects, though what you hear, and when you hear it, depends on the distance between you and the person shooting, and how close their bullet comes to hitting you. First, there's the sound of the gunshot, which has a propagation delay. "The propagation velocity is 340m/s so if a pistol is shot 340m away from the listener, he will see the muzzle flash first and hear the gunshot after 1 second," writes Marek, Battlegrounds' lead gun designer. If you hear a 'whizz' sound that means a bullet has flown past you. You may also hear a crack sound, which is the "bullet bow shockwave." This occurs when the bullet, flying at supersonic speeds, passes you. The radius for the whizz and the crack are different, with the whizz radius being considerably bigger. In other words, if you hear a whizz and a crack, the bullet has passed very close to you, and if you only hear a whizz, it was close but not that close. The gunplay feels pretty tight. Sounds of weapons firing is decent - when i hear them in the distance i know approximately where people are. I'll often move towards them and catch them leaving an area for an easy kill. What im not hearing though is when other players are in close proximity, like in nearby or the same building. I think that local sound work of footsteps/opening doors etc needs work. Nice one, was that solo? I like solo as it seems a bit faster between gas advancing yeah?